From the big yellow buses we put our children on each morning to the city buses we ride in our daily commutes and the buses that let us tour a new city, we have a right to expect buses to be safe. In addition to ensuring that the vehicles are functioning properly, bus companies should be held responsible for ensuring that their policies and practices encourage safe driving. A recent study raises questions about whether a major bus company has been putting passengers at risk due to drowsy bus drivers. With several high-profile bus accidents in our own region in recent years, this study is of great concern to our San Francisco bus accident lawyer. CNN recently looked into the safety practices of the Greyhound bus company, the largest bus company in North America that transports some 18 million passengers across approximately 5.5 billion miles each year. The investigation was partly inspired by a 2013 accident that left one woman dead and many more injured. Passengers on that tragic bus ride believe that their driver fell asleep at the wheel. At least one pending lawsuit involving 22 of the passengers suggests that Greyhound is at fault for allowing a dangerously drowsy driver to operate a bus. Greyhound denies that fatigue was a factor in that crash. CNN conducted an investigation to determine if there is a pattern of bus driver fatigue at the company. CNN found internal documents suggesting that Greyhound drivers should stop every 150 miles or so, take a walk around the bus, inspect the vehicle, and stretch in order to fight the potential effects of fatigue. However, CNN reports that the so-called Rule G-40 is treated more as a guideline than a rule and is not enforced. 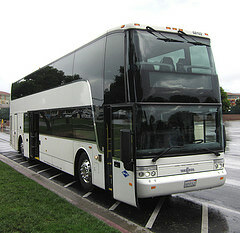 Notably, the investigation found numerous posted Greyhound routes on which required stops are more than 150 miles apart which the news agency states means “the onus is on the driver to make 150-mile safety stops.” Other documents support the theory that Greyhound shifts the burden to drivers to decide if they are too tired to drive. In a deposition in another case, the CEO suggested he’d be fine with a driver travelling 333 miles without a break if the driver felt no need to stop. Additionally, CNN cites a 2012 government study that found driver fatigue led to 32% of all passenger bus crashes. More specifically, 5 of the 184 fatal passenger bus crashes between 2010 and 2014 have been blamed on driver fatigue. CNN’s report also mentions a deadly Greyhound crash in San Jose in which the driver told police he felt fatigued prior to the accident. It is unclear if the 150-mile rule was followed in that case. On its Facts and Stats: Drowsy Driving webpage, the National Sleep Foundation (“NSF”) cites several studies on the danger of drowsy driving. One study by the AAA Foundation for Traffic Safety found that even sleeping six to seven hour nightly instead of a full eight hours renders a driver twice as likely to be involved in a sleep-related crash. That study found sleeping less than 5 hours led to a four to five times greater risk of such an incident. The NSF also cites an Australian study that found being awake for 18 hours caused a driving impairment akin to a blood alcohol level of .05 and being awake for 24 hours raised the equivalent to .10 (.08 is the legal limit across the U.S. although some at the National Transportation Safety Board have proposed lowering it to .05). Driving drowsy is dangerous. Driving a bus drowsy only increases the risk, both for the passengers and those around the large, heavy vehicle. Companies must be held responsible when their policies and practices put people in danger. Victims of these accidents deserve compensation and holding companies accountable can prevent future tragedies. If you or a loved one has been injured in a bus accident in the San Francisco area, call our office at (800) 427-7020. We serve the entire Northern California area and have offices of our bus accident law firm in Oakland, Santa Rosa, and San Francisco.